This afternoon (just two days after the Monty Python 40-year reunion in New York) Terry Jones held a seminar at The People's Impov Theater where he discussed the creation of classic Monty Python sketches and the writing process in general. The proceedings were moderated by Python expert Kim "Howard" Johnson. He showed both classic and rare (pre-Python) clips spanning his career, and the students also had a chance to ask questions! TERRY JONES is a Welsh comedian, screenwriter, actor, film director, children's author, popular historian, political commentator and TV documentary host. A founding member of Monty Python, Mr. Jones directed two other Monty Python films, Life of Brian and The Meaning of Life. Outside of the Python group, Mr. Jones also directed Erik the Viking (1989) and The Wind in the Willows (1996), released in the U.S. as Mr. Toad’s Wild Ride in addition to other projects. Mr. Jones has written books and presented television documentaries on medieval and ancient history and the history of numeral systems including Terry Jones’ Medieval Lives for which he received an Emmy nomination in 2004. In 2008, Jones also wrote and directed an original opera entitled Evil Machines which was premiered by Teatro São Luiz in Lisbon, Portugal. 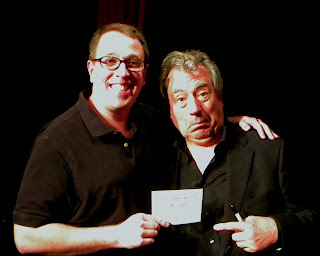 Me with one of the funniest people in history, Mr. Terry Jones. The card I am holding up (and unfortunately washed out by the stage lights) reads "My Pee Smells Like Ham". If you have to ask, you've never been to a Motionfest or Minifest. Find out more about them by clicking the title of this post. That finishes milky bah-bahs when he's in the mood? When there's binkies all about? CLOWNALLEY.NET VOLUME 3 DVD OUT NOW! 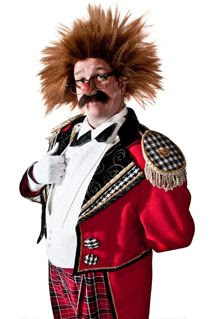 THE CLOWNALLEY.NET VOLUME 3 DVD NOW AVAILABLE ON EBAY! To order, please click the title of this post to be taken to the eBay listsing. Thanks! 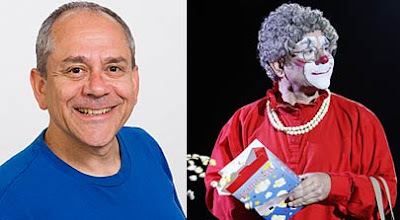 Barry "Grandma" Lubin, star of the Big Apple Circus and member of the International Clown Hall of Fame, is teaching an upcoming class at The Learning Annex in New York. Mr. Lubin is an extremely gifted performer and an excellent instructor. If you've never had the opportunity to take a class with him, don't miss out! Who is this? Big Bird?!? AH-HA! This bird is not big at all! 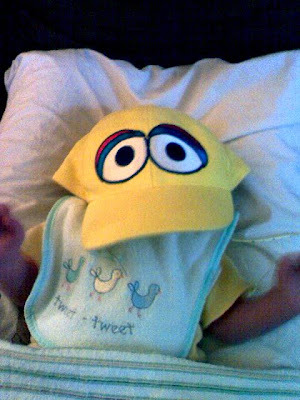 In reality you have been fooled yet again by the incomparable Mr. James Roane Cashin, newborn master of disguise and "Baby of 1,000 Faces". Call the Sesame Workshop and let them know that when Carroll Spinney is ready to retire J-Ro is ready, willing and more than able to fill his fleece-covered, three toed shoes! 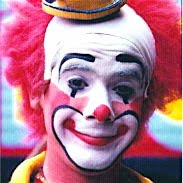 My favorite circus memory, after meeting my wife, Nini, happened in Chicago in October, 1976 at the old iron and glass arena near the old stockyards. We'd played there some weeks already - the weather usually cloudy, chilly, and damp. It was a Saturday morning show - too early in the morning that day. I wasn't feeling well - tired, lonesome, a little sad... just feeling down. I dry shaved that morning, and my skin reminded me of its objection to that as I applied my clown makeup. I had a bit of a headache from trying to rinse out the blues the night before. Even pie car coffee couldn't wash the bad taste out of my mouth. Brother, I was feeling sorry for myself! I was doing meet and greet on the track floor as our guests came filing in along the rope fence by the track as they made their way to their seats. I was doing my best to put my heart into it, but my heart just wasn't cooperating. 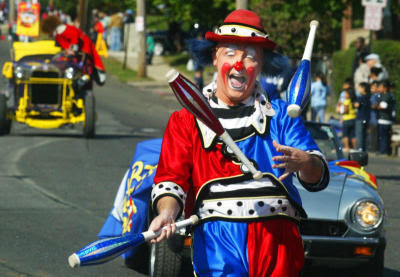 Then I heard a small, clear little voice calling out, "Clown! Clown! ", with the rise and fall tone of one trying to get my attention. I turned to my left, and saw running down the track toward me a little cherub of a girl no more than five years old - running with just a remnant of 'toddle' in her gait. She looked like a little doll - little chubby legs with white ankle socks and black patent shoes, frilly dress, navy coat that gathered at the waist, a beaming round face with the biggest of toothy smiles and such bright eyes and big ringlets of auburn curly hair. Following at a trot several paces behind her was her mother, a well dressed, handsome, willowy woman with a flustered and embarrassed look on her face. As the little girl got close, she raised up both her arms signaling she wanted me to catch her and pick her up in my arms - which I did without even thinking about it. She wrapped her arms around my neck and squeeeeeezed with a big hug, and then leaned back with her hands on my shoulders and looked me in the eyes and said, "I love you, clown!". "I love you, too, sweetheart." She kissed my cheek and then got down - and she skipped stepped over to her mother and took her hand, walking away to find their seats. As she went with her mother, I saw her looking up at her with a thoroughly happy expression, and telling her, "I talked with the clown, mama! I talked with the clown!" Up the bleacher stairs they went, and I just stood there, arms at my sides, just watching them until I couldn't see them any more. I heard a collective and soft, "Awwwwwwwwww....." from my right, from the folks I'd just been greeting when the little angel jumped into my arms and into my heart. They all had eyes as moist as mine. That little girl, that little angel would be in her late thirties by now. Wherever she is, I just want her to know that on that morning, with her expression of pure affection, joy, and a child's simple love, she reminded me that I am loved and changed my outlook for good. God indeed sent me an angel. Burt Reynolds? No! 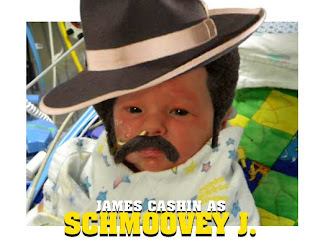 Once again you've been fooled by America's own James "Jamie" Cashin, the world's most beloved character actor, adored for over a week by critics around the globe as "The Baby of 1,000 Faces". 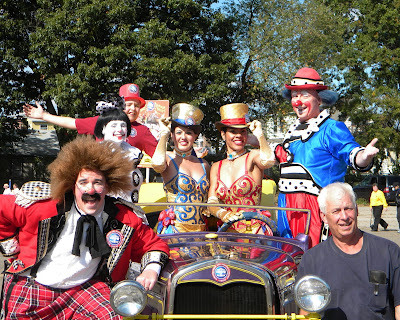 The Ringling Bros. and Barnum & Bailey Greatest Show on Earth contingent from the Bridgeport, CT Columbus Day Parade: (from left to right) Pat Cashin, Cherie Gregg, Jonathan Hunsberger, Lisa Glover, Priscilla, David Gregg, Jerry "Scooter" Hunsberger. 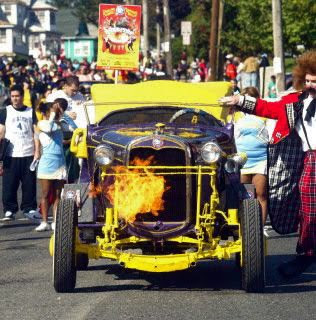 This is the 2nd year in a row that we've got the car (with the flame) in the same paper. May All Your Days Be Columbus Days! Once again the amazing James Roane (or J-Ro if you're nasty) Cashin, the world reknown "Baby of 1,000 Faces", is back to astound us all with his incredible versatility. 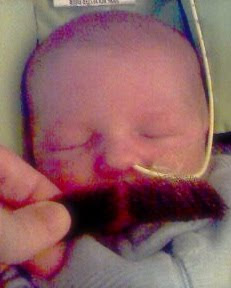 Pound for pound, he is undeniably America's greatest living character actor under the age of 9 days old.